Of course there was no way I wasn't going to do the same again the next morning; get up early and head out into another dismal summer's day. 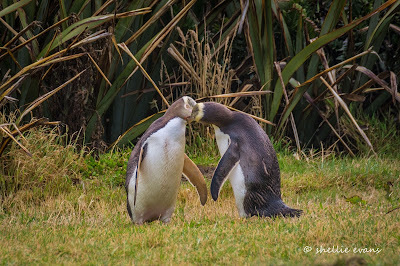 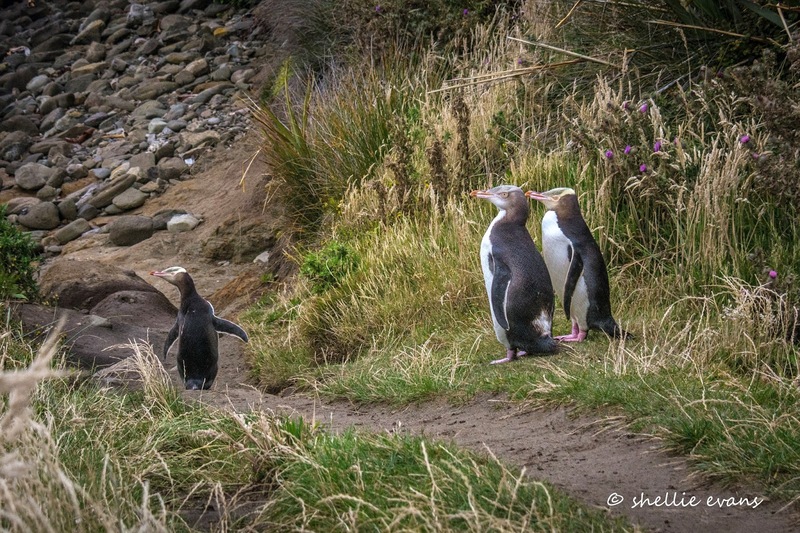 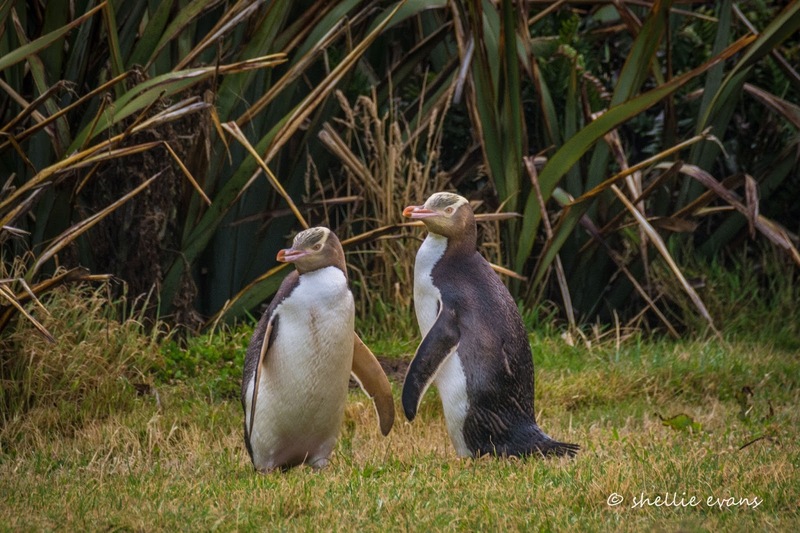 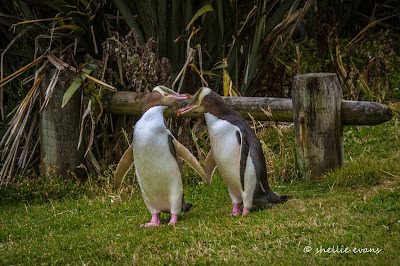 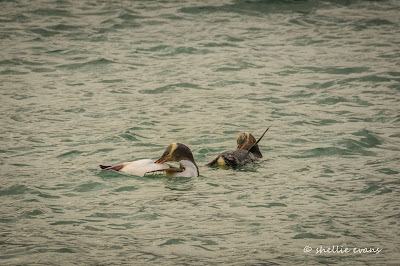 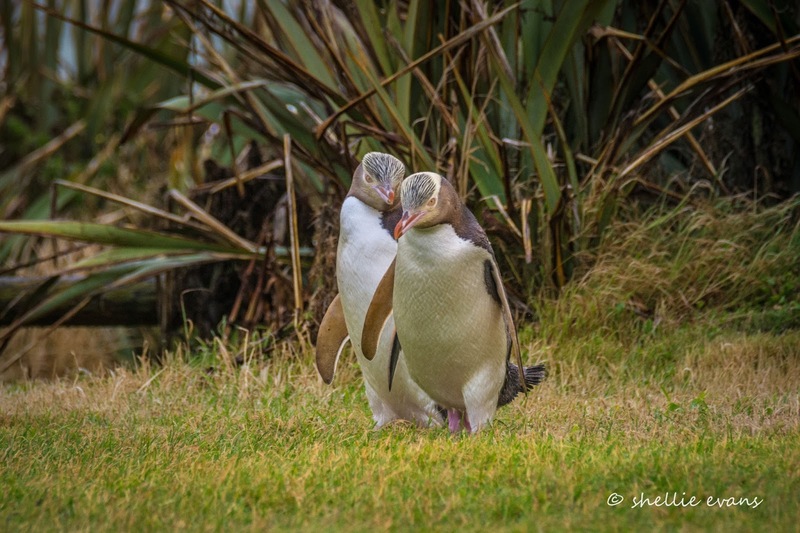 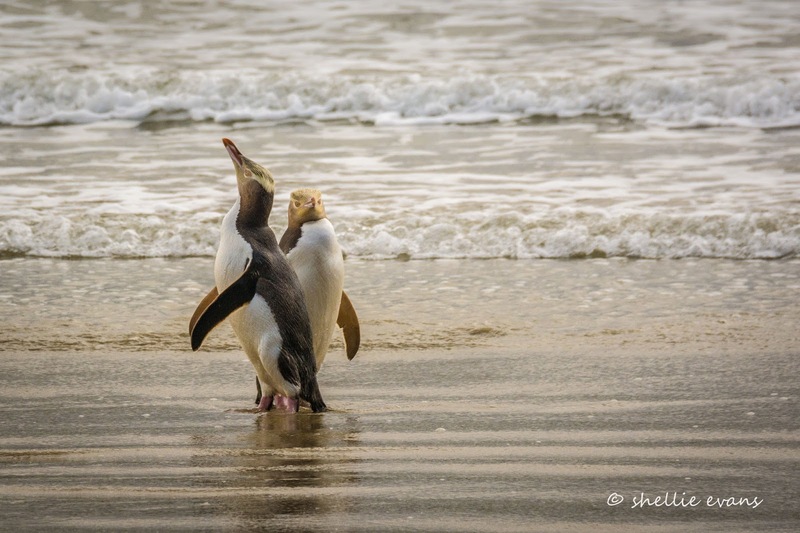 I wasn't going to miss another possible encounter with the Yellow-eyed Penguin/Hoiho pair. 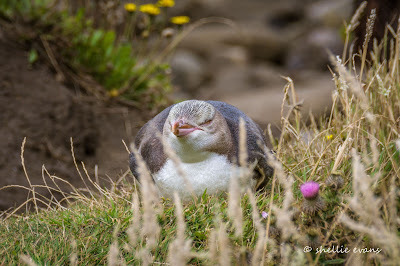 David rolled over and mumbled something about he'd wait to read the blog (it's been a long wait). 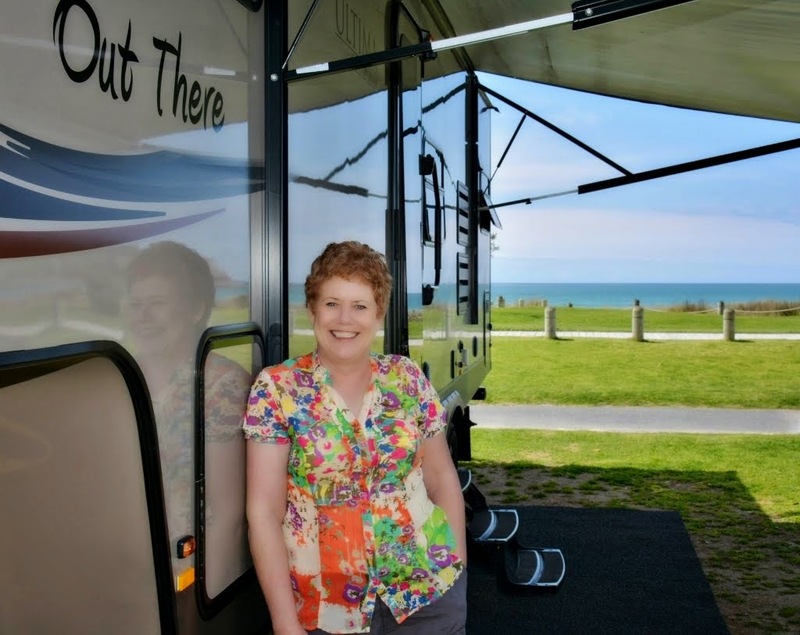 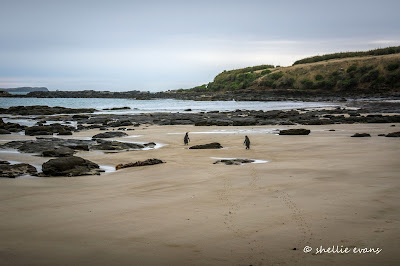 I pulled into the Curio Bay Campground carpark again and was a little disappointed that my penguin pair were nowhere to be seen. 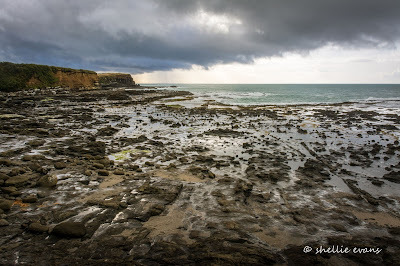 I walked to the edge to check out the rocks and beach below. 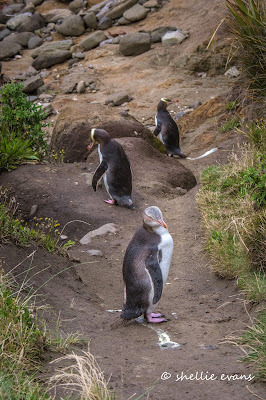 I couldn't believe my eyes when I glanced down the track, half way down, sound asleep was a penguin. 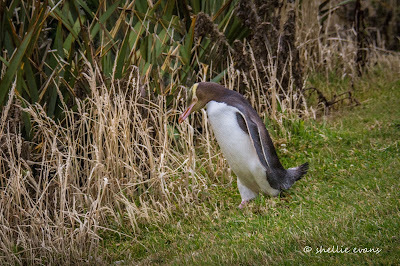 ...stood up and started preening. 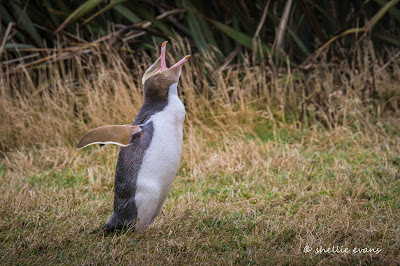 He's got the itches too! A tell-tale sign his moult has started is the feather stuck to the end of his bill (I have no idea if it was a he or a she). 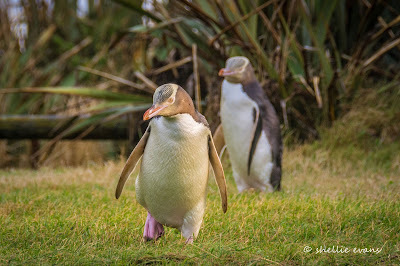 Then, while I was watching the juvenile, I saw some movement on the penguin track above him and out popped my adult pair! 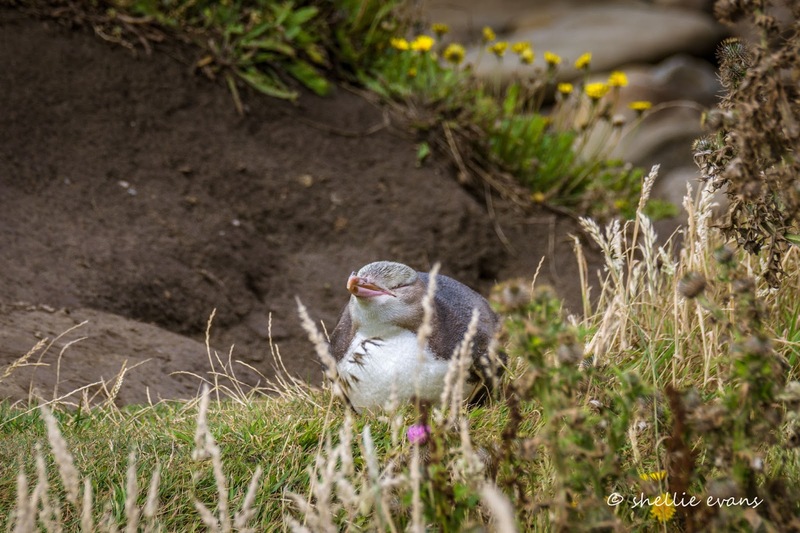 And going by the greeting they got, the juvenile is likely to be their chick from last year, come home to begin it's moult. 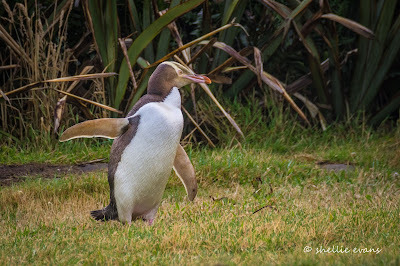 The adult pair have a chick (or 2) hidden in the flax bushes further up the hill behind the carpark, it's where I saw one of them head to, and then return from yesterday. 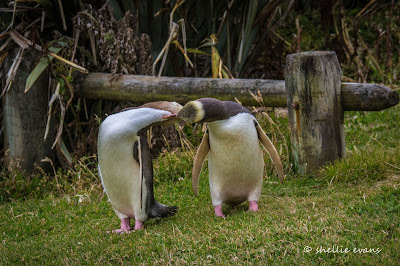 Three penguins; preening (& pooing) right there in front of me! 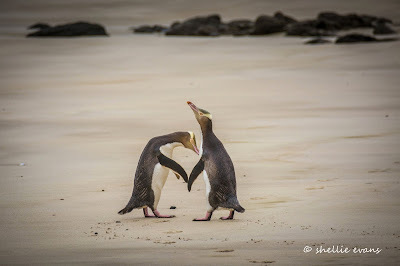 How wonderful, how exciting, could it get any better? 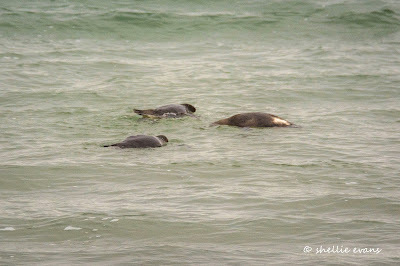 One of the adults decided to have a lay down while the other two carried on doing their ablutions. Junior is ahead of his parents in moulting (they still have to fledge this year's chick/s), the white patch on his rump is the start of a 4 week process where, unlike other seabirds, they moult all their feathers at once. 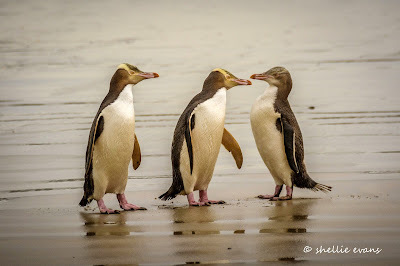 During the moult, because the new plumage is not waterproof and the body not well insulated, they cannot go to sea to feed They will also lose up to 3 to 4 kg in weight. 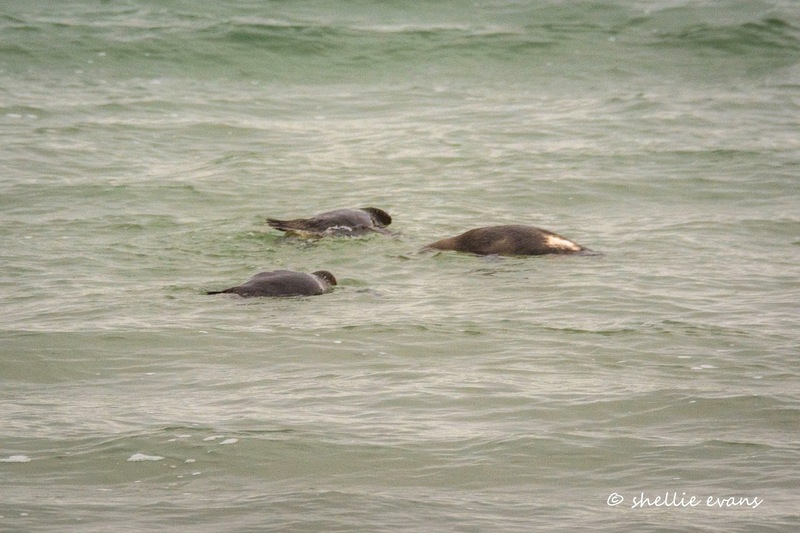 This also makes them very vulnerable to disturbance on-shore from humans and dogs. 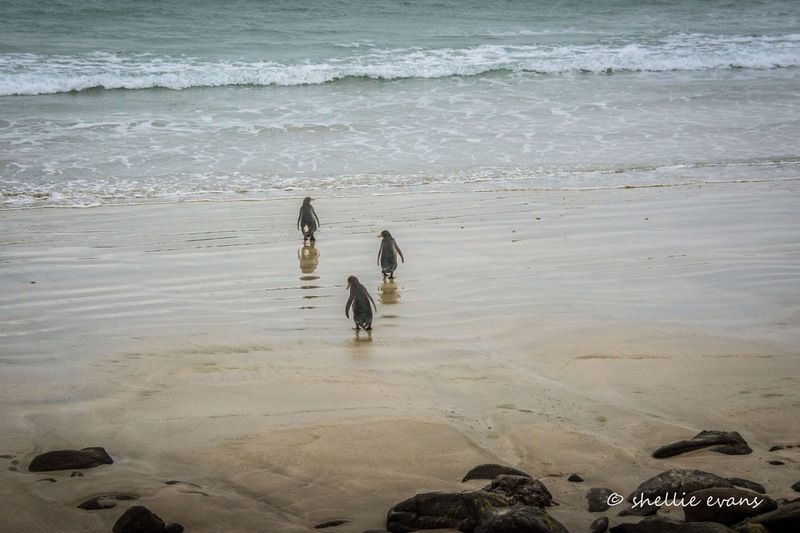 ...and then waddled off towards the ocean, Junior leading the way. 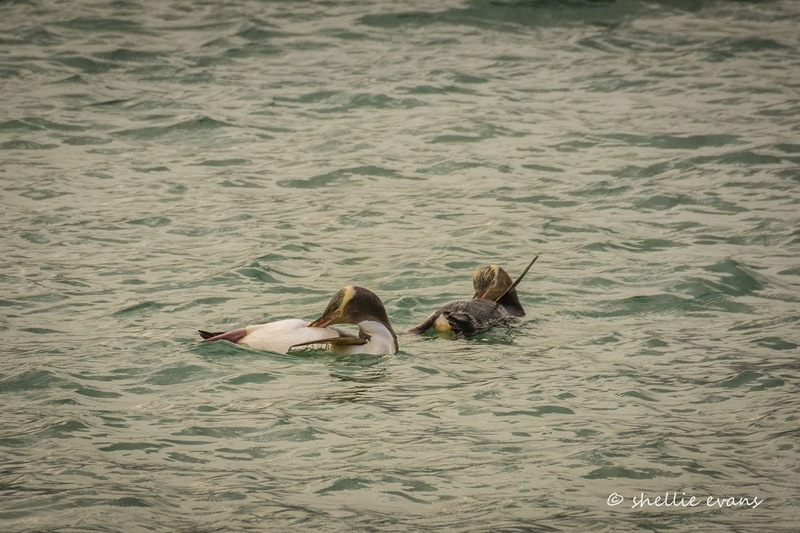 I thought once they were in the water they'd be gone in a flash but no, they spent another 15-20 minutes floating about in the shallows, preening and ducking and diving in short fast spurts, then preening some more. 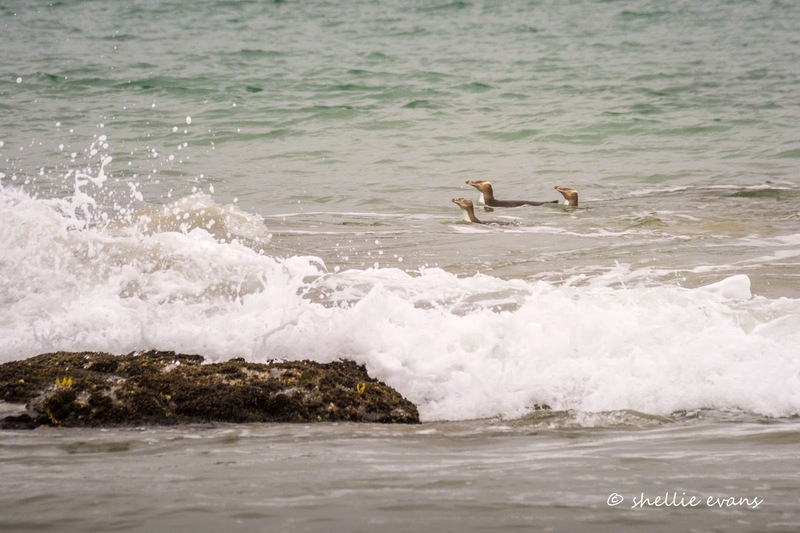 And then the biggest surprise of all, they swam off, still in the shallows, heading along the back of the breakers and past a small rocky platform. 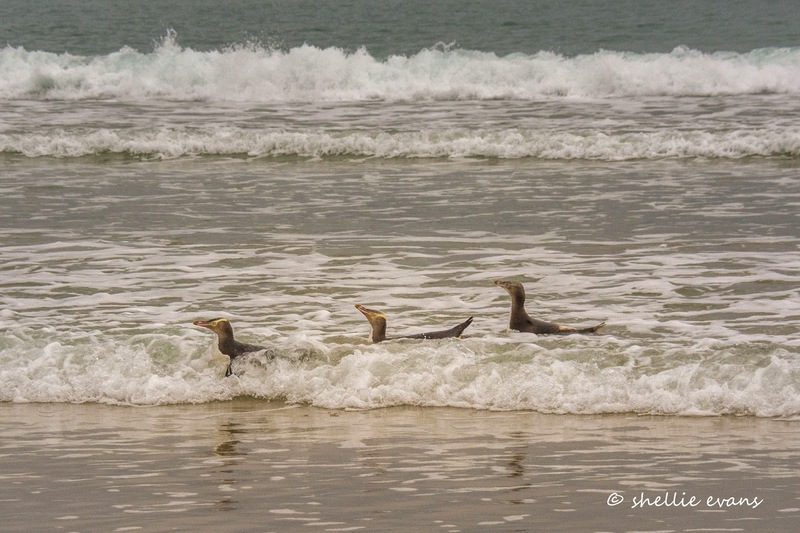 I followed along, as they moved closer in through the breakers. 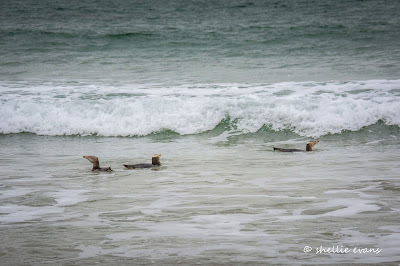 I was thinking they would soon turn and head out. 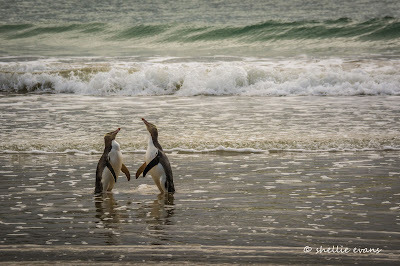 They came waddling out of the water right in front of me! 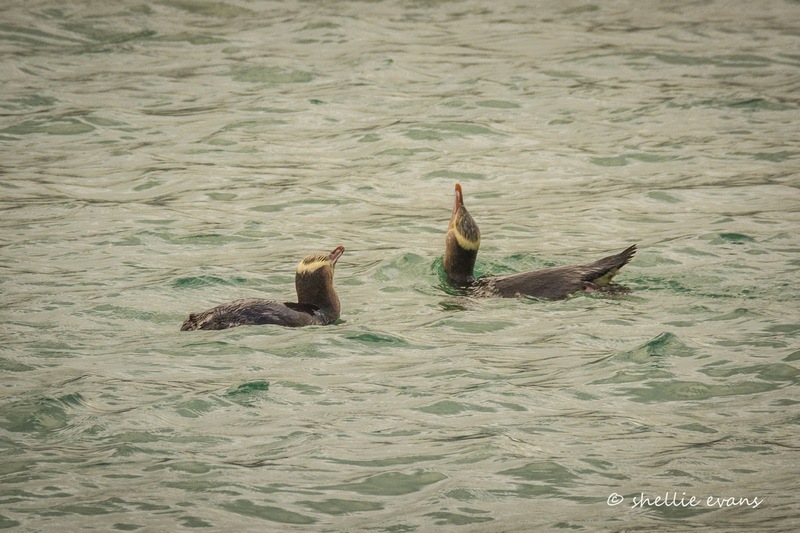 And then started preening once again! 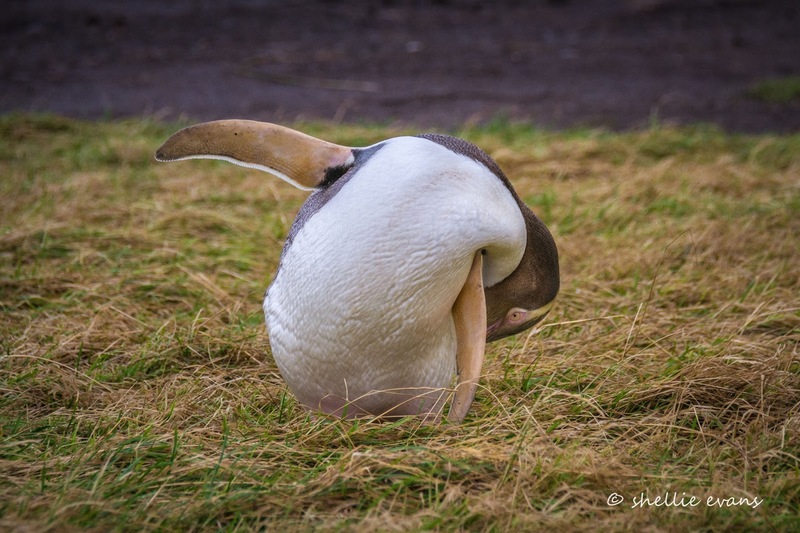 One last wing stretch, and they're gone. 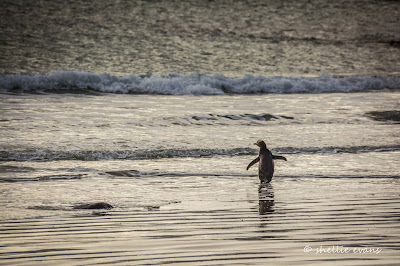 I make my way back to the carpark, Junior has settled at the bottom of the track out of sight, hopefully he'll be ok, he's right in the line of fire once the daily tourists converge on the carpark and make their way to the beach to check for dolphins and/or penguins. 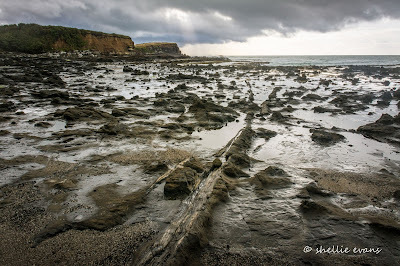 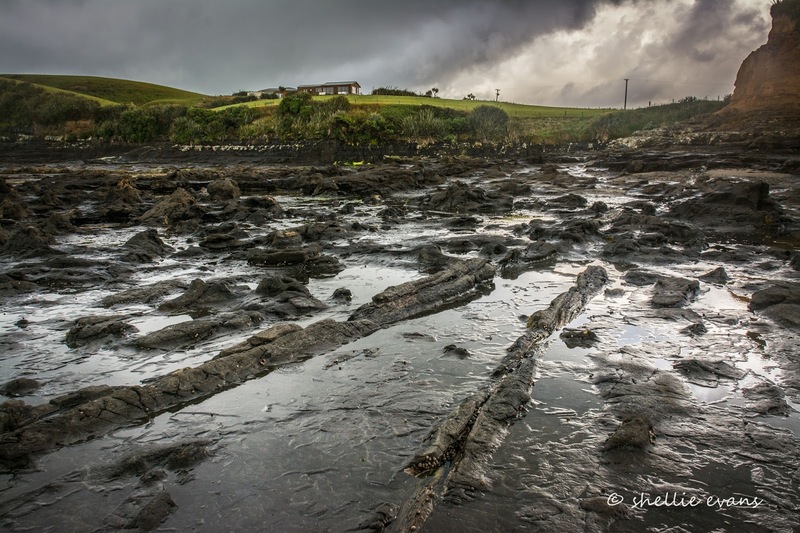 I head to the Petrified Forest at Curio Bay, just down the road. 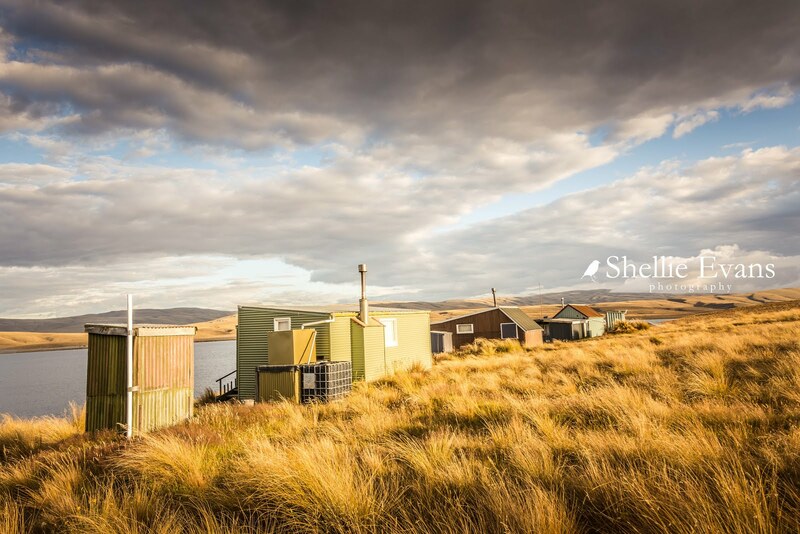 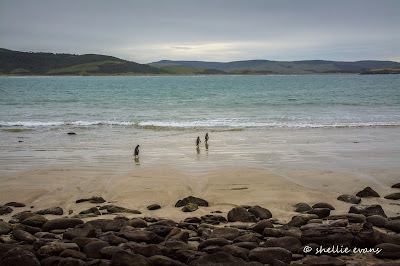 It's where we had a another great encounter with a penguin during our last visit to the area. 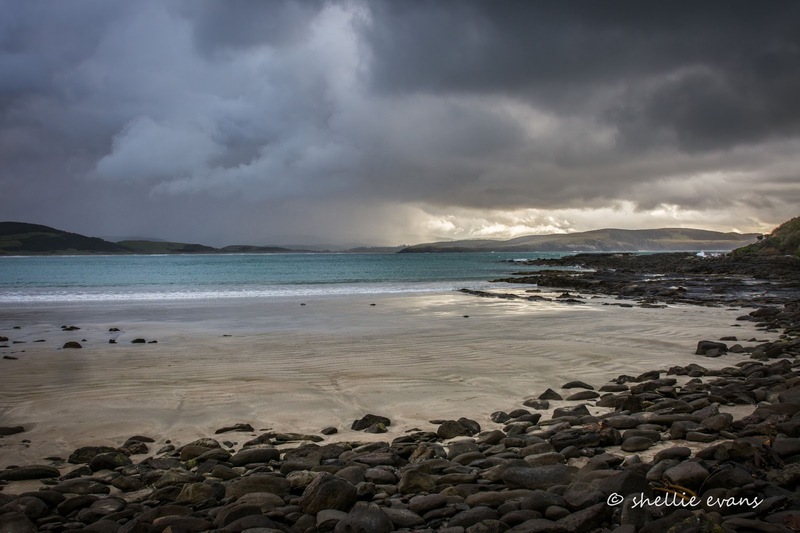 And anyway, the weather has taken a turn for the worse, a cold southerly wind is blowing hard and big fat spots of rain are hitting me and my camera lens. It's time to head for home. 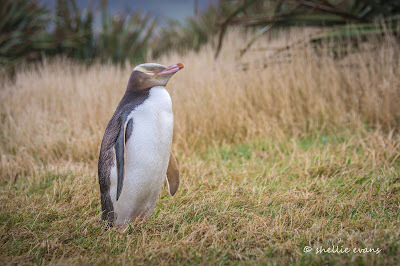 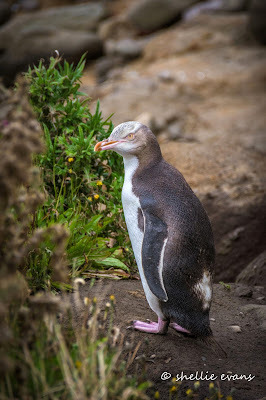 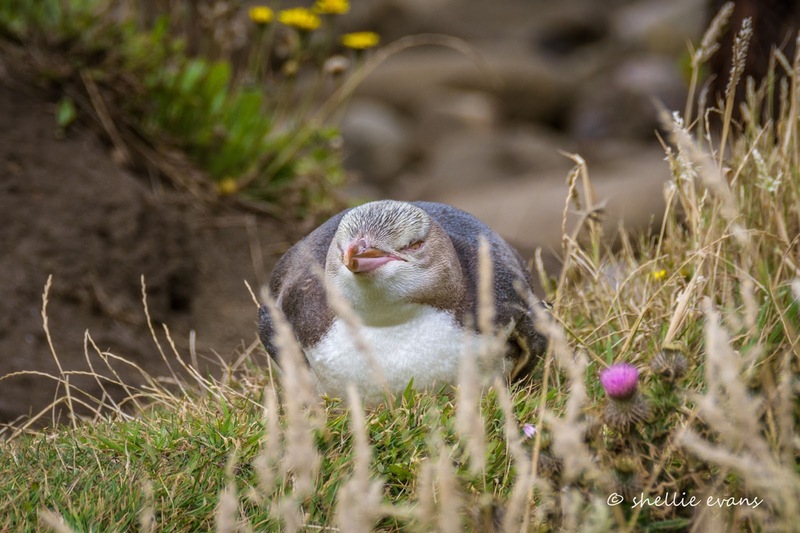 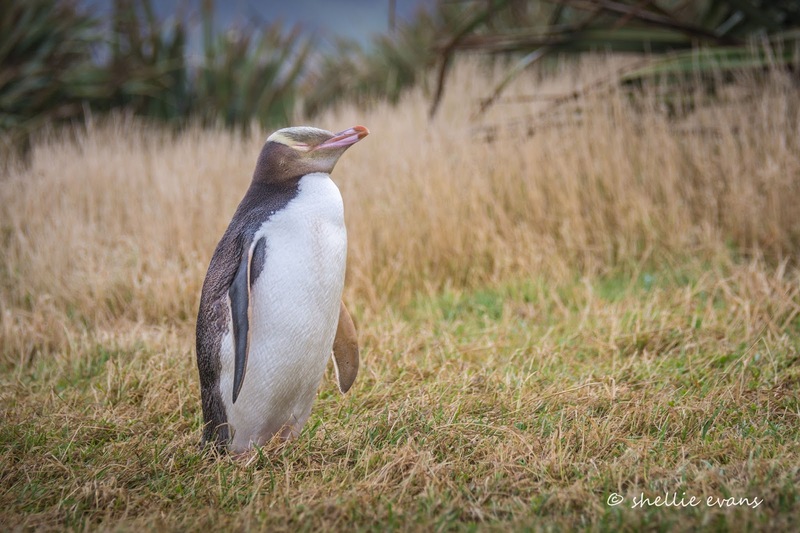 I didn't quite get to post about the best Catlin experience of them all- not one but two encounters with the beautiful Yellow-eyed Penguin/Hoiho at Porpoise Bay. 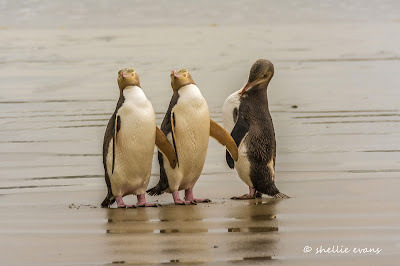 I don't like to anthropomorphize them but they are just so darn cute & comical it's easy to put a caption to their every move. 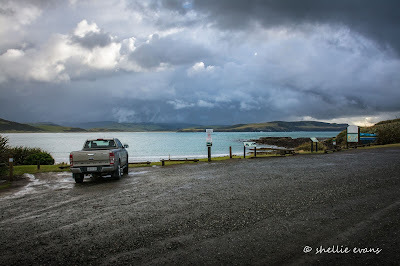 We were still staying at the NZMCA Park at Niagara where, you'll recall, the weather was really grotty. 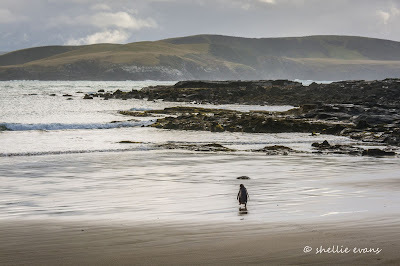 But I wanted to locate some penguins before we left; we'd had an awesome experience with some the last time we visited the Catlins and I wanted a repeat. 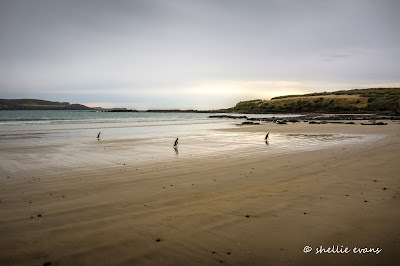 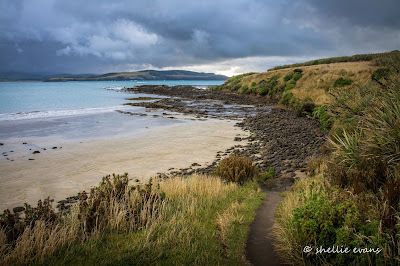 So, around 5:30am on a cold and drizzly summer morning, I dragged myself out of bed and headed to Curio Bay 12kms away. 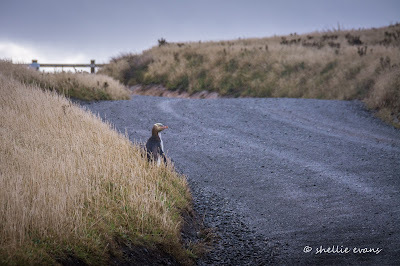 I took the Netspeed modem and my laptop with me so I could check for emails at the lookout too, the only spot for miles that we could get reception. 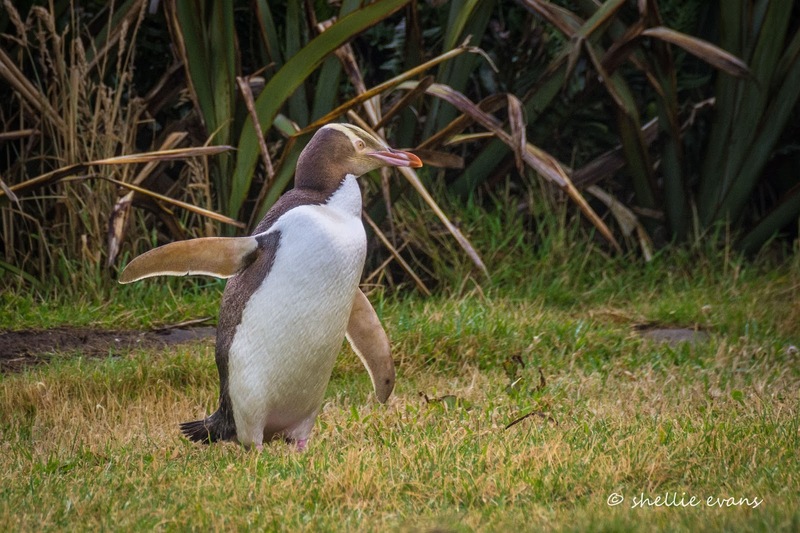 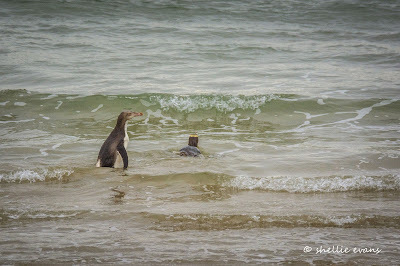 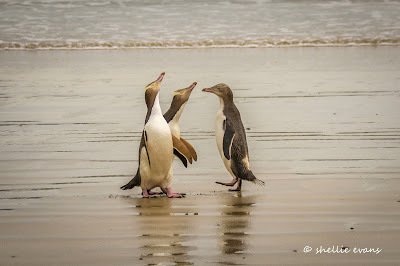 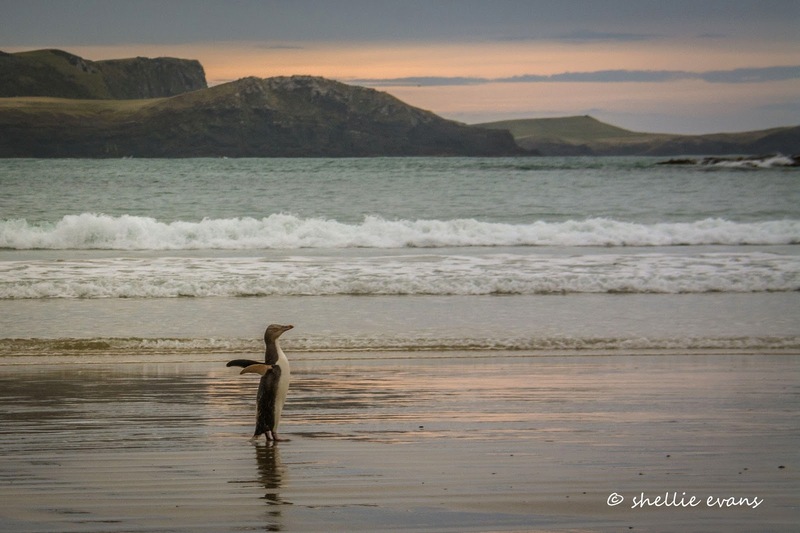 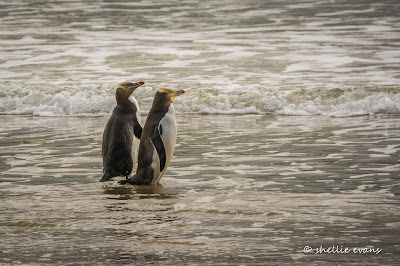 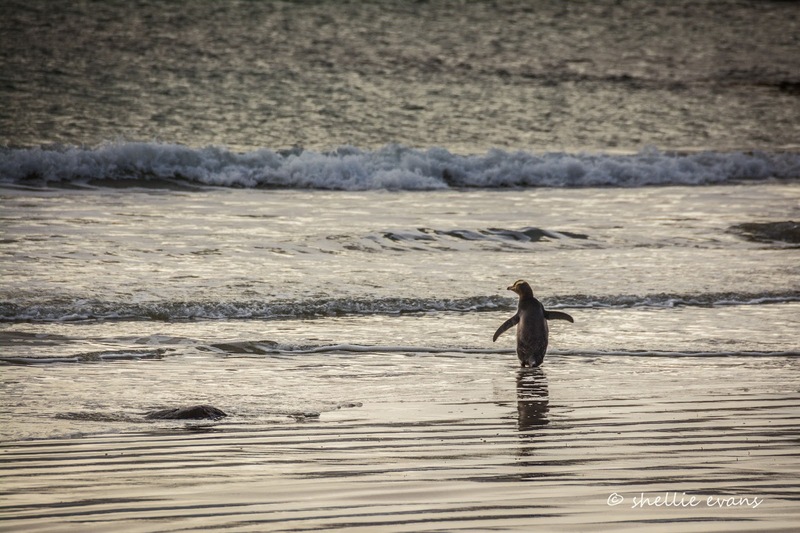 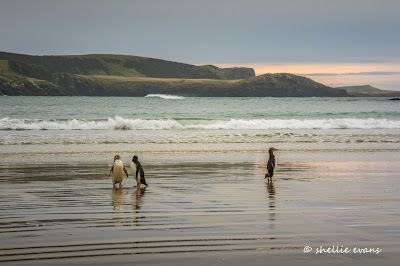 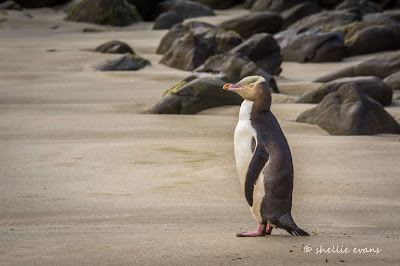 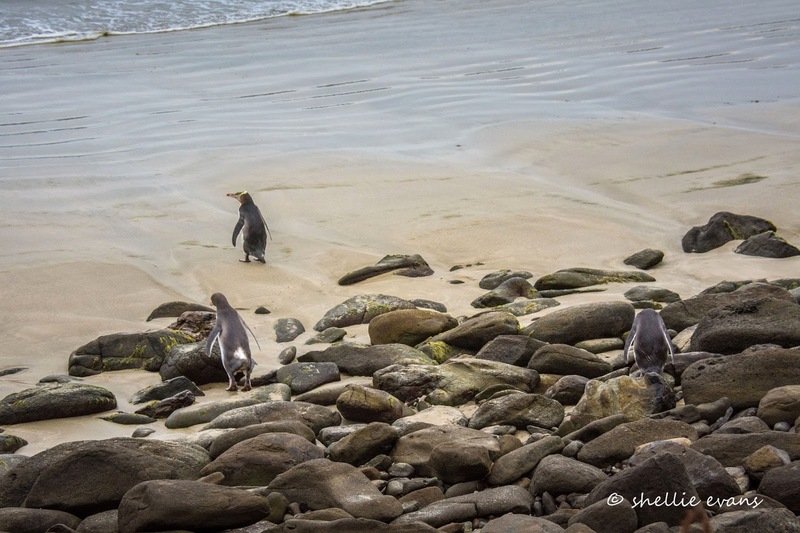 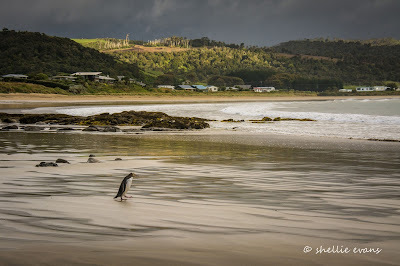 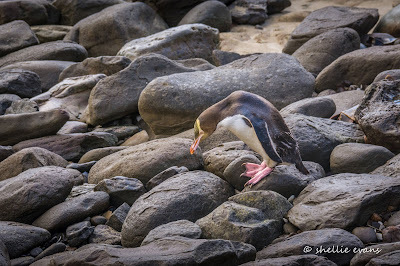 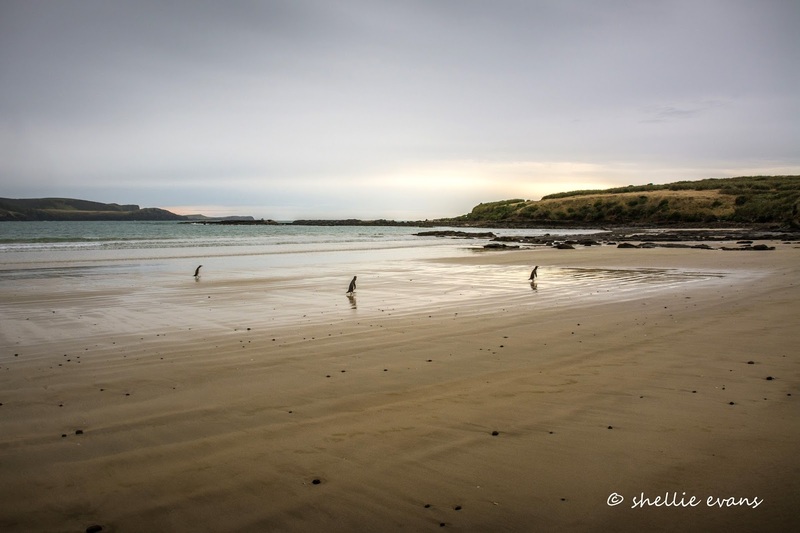 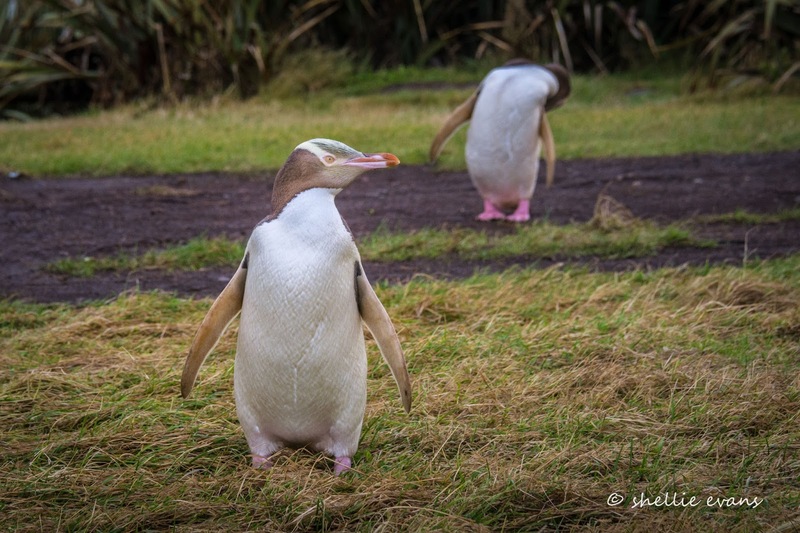 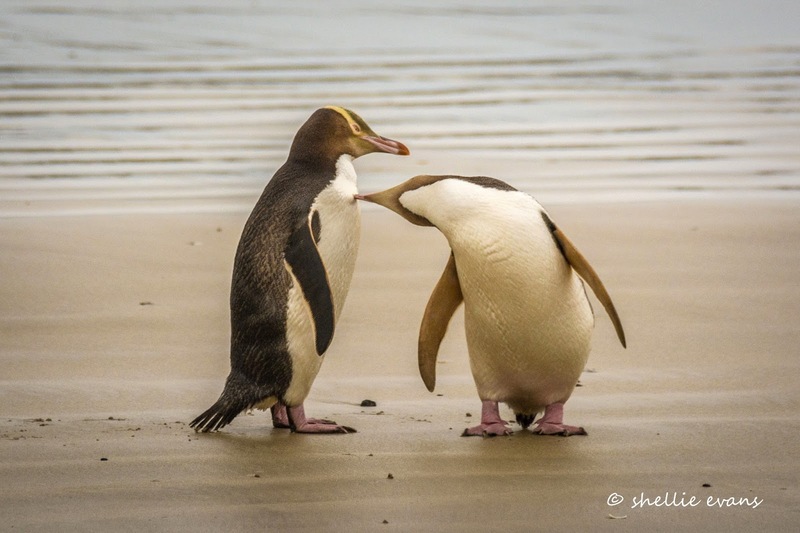 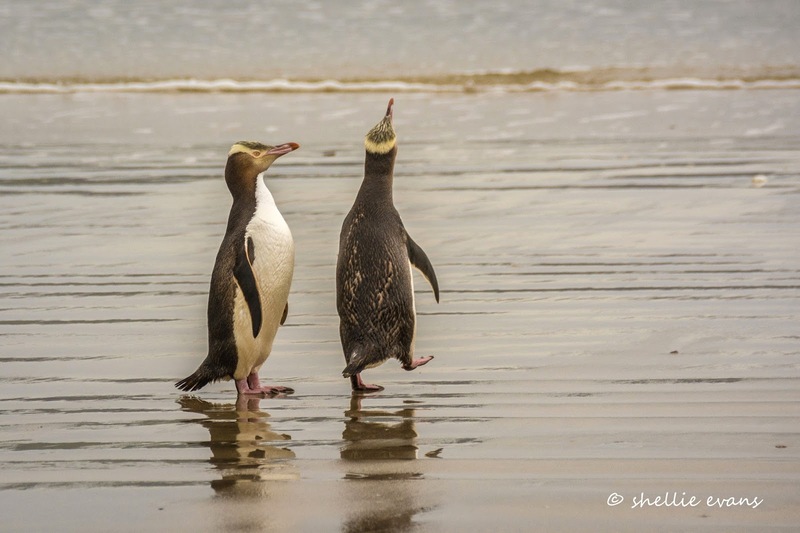 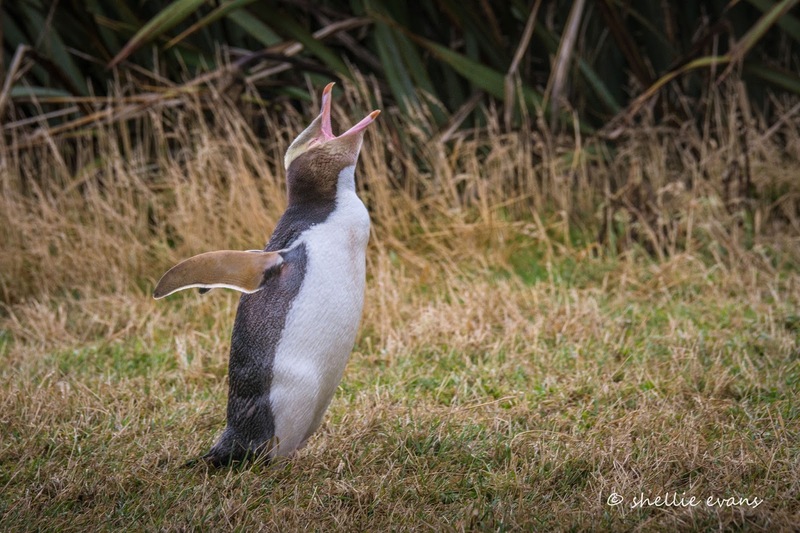 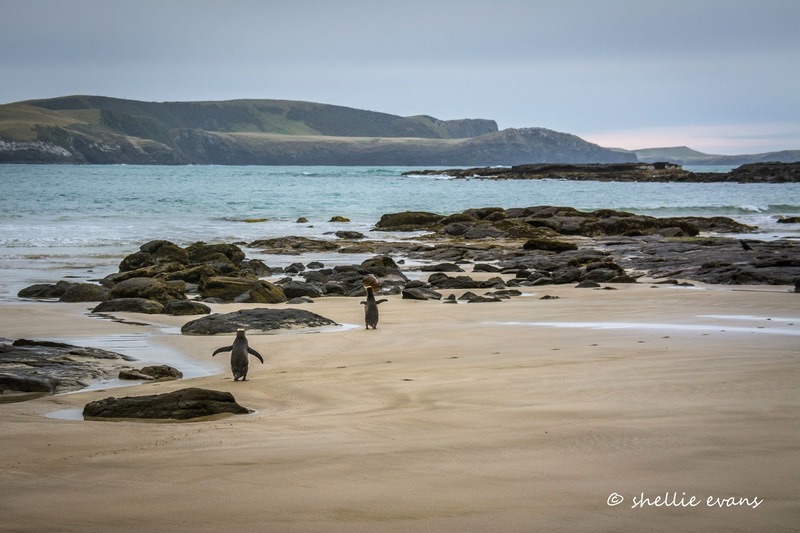 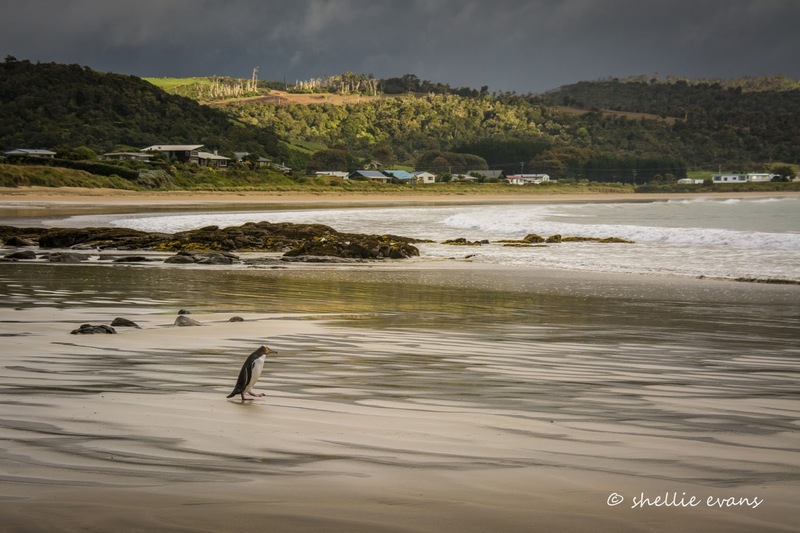 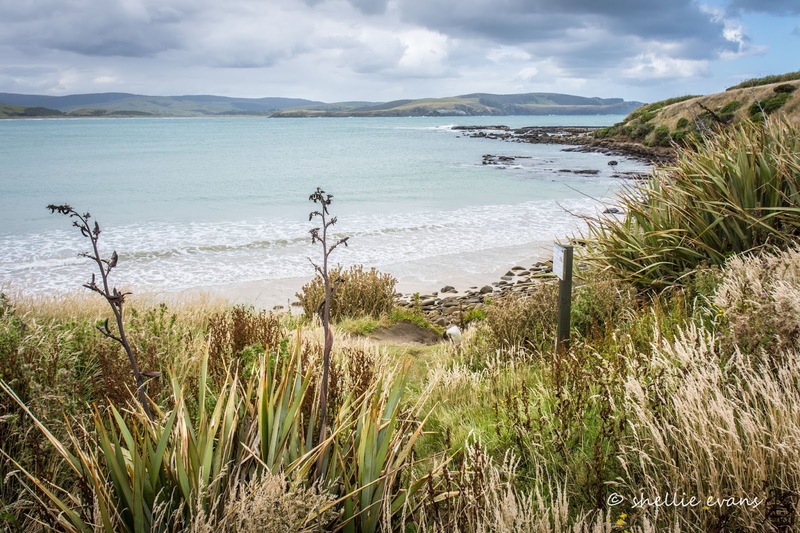 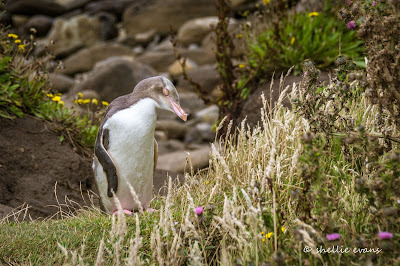 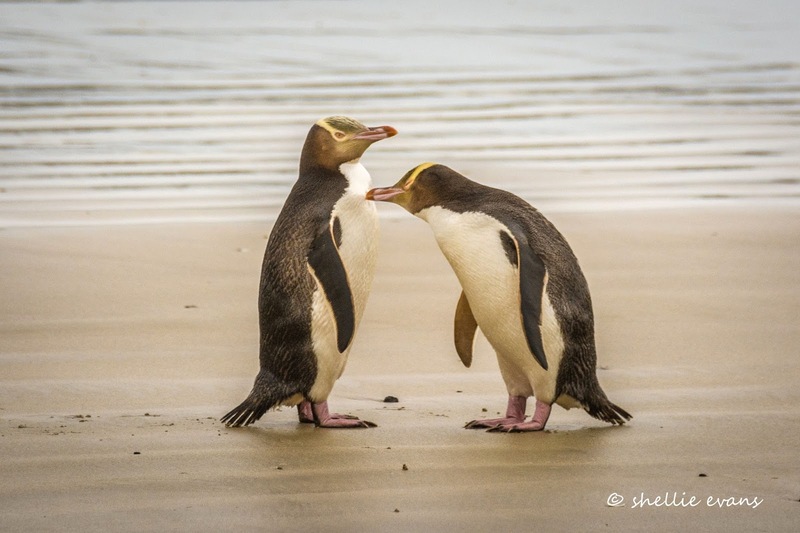 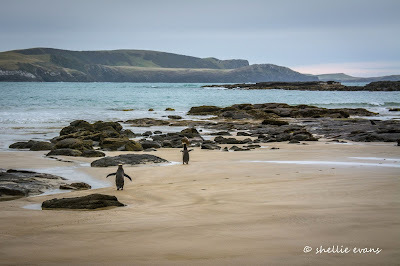 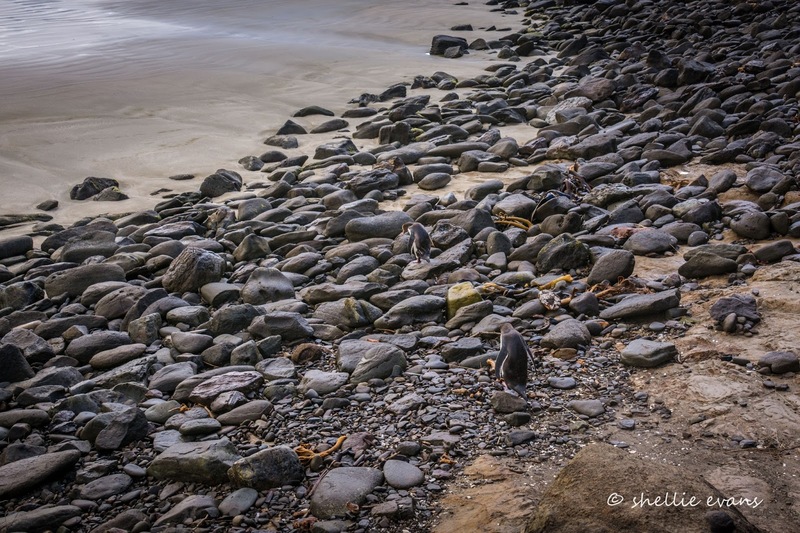 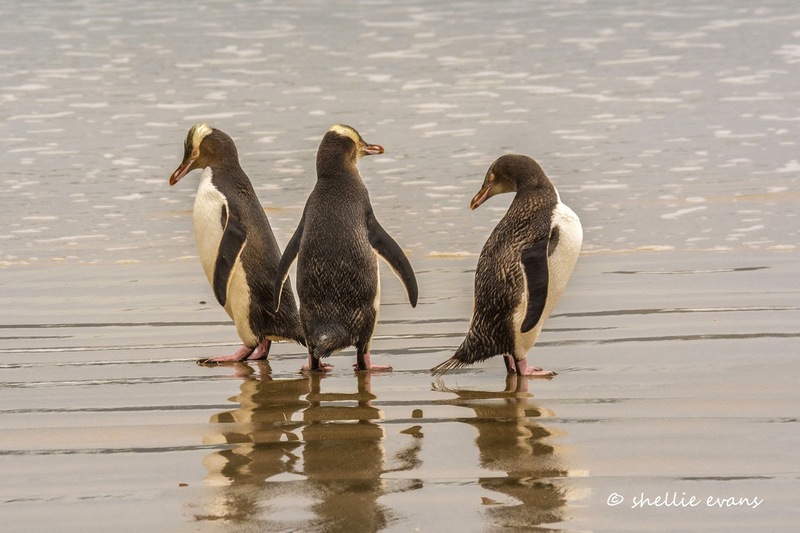 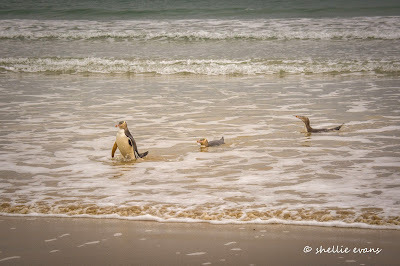 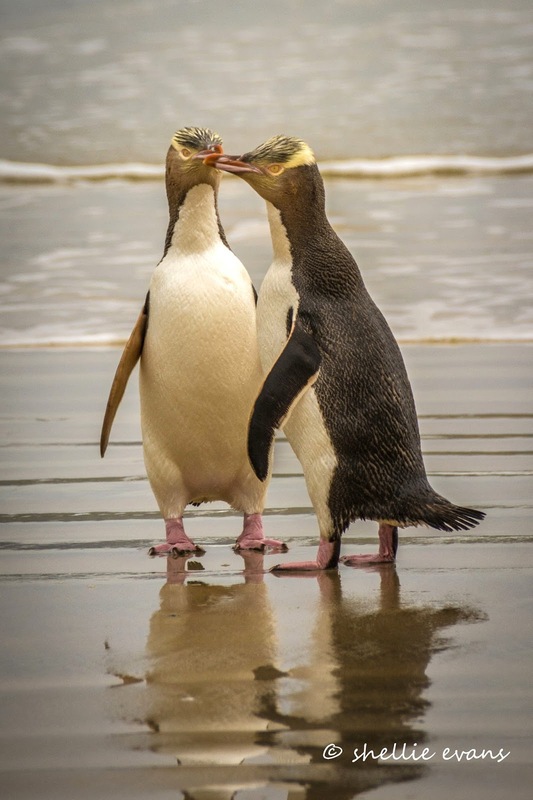 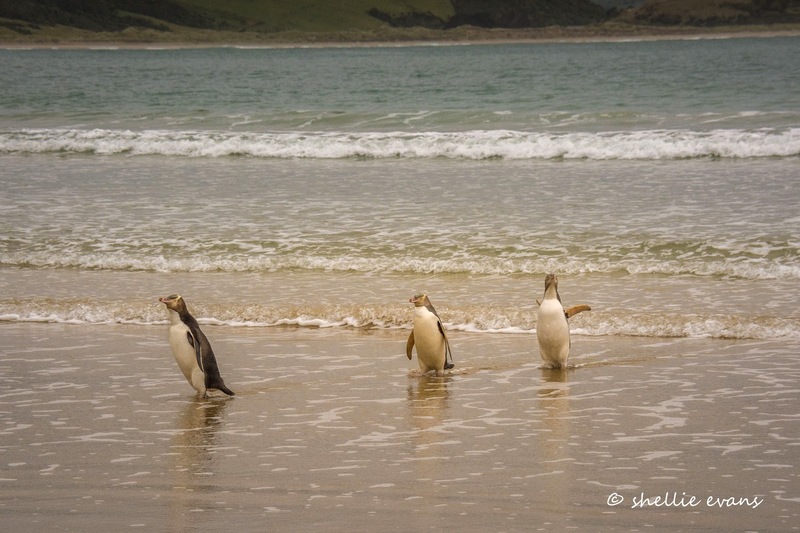 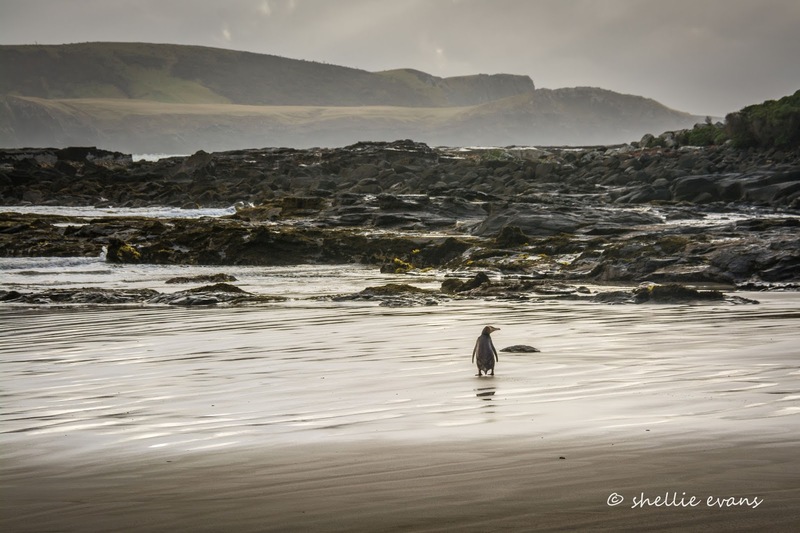 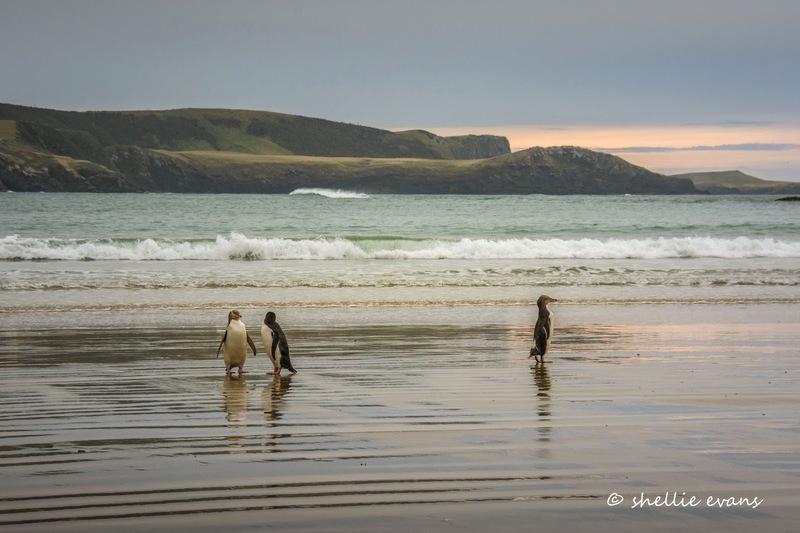 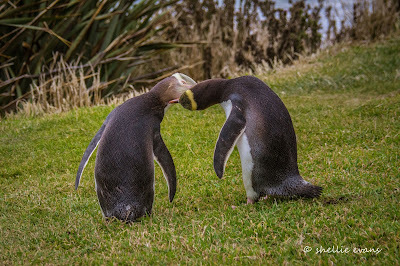 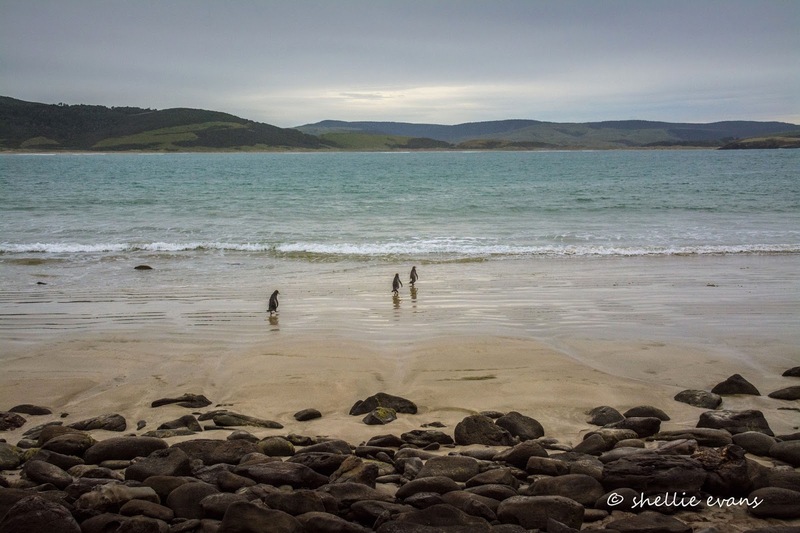 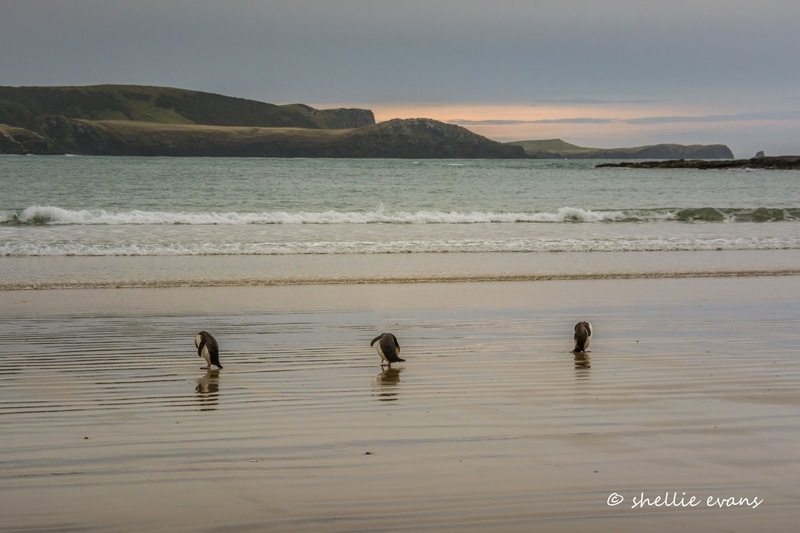 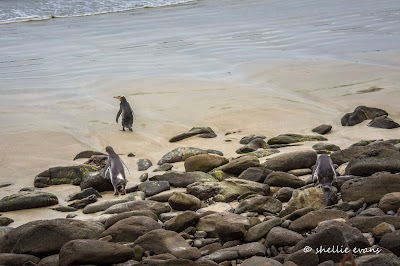 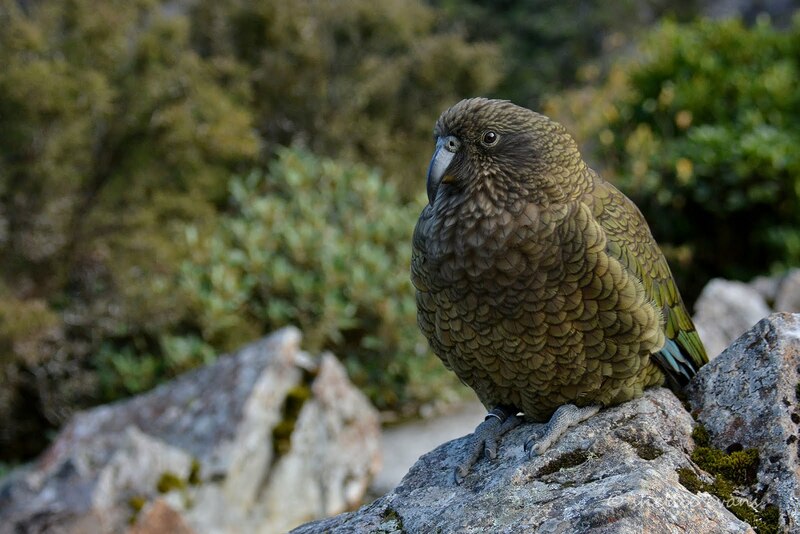 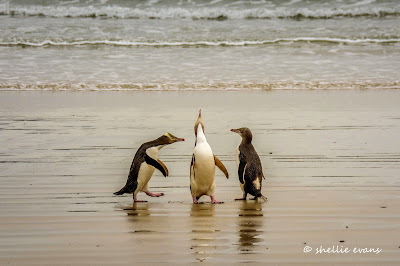 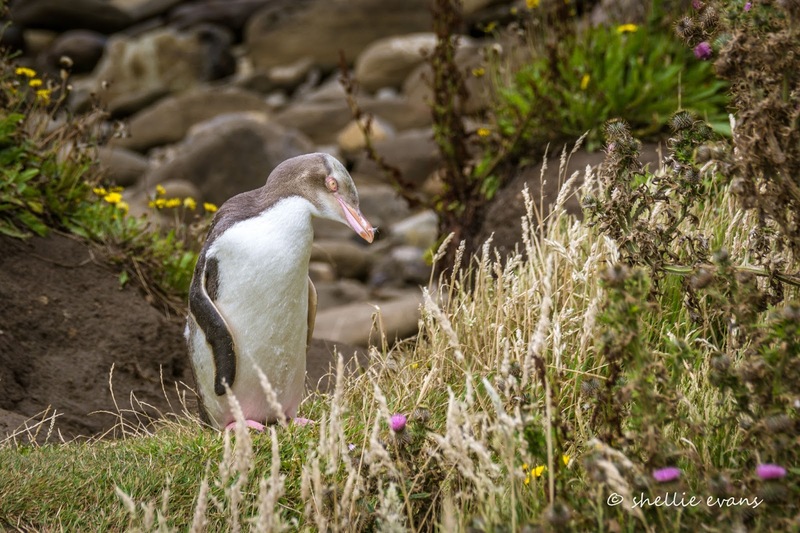 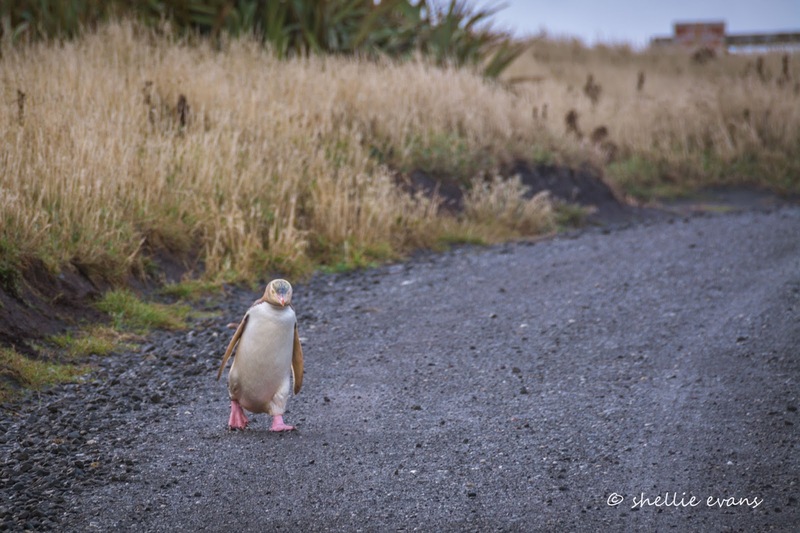 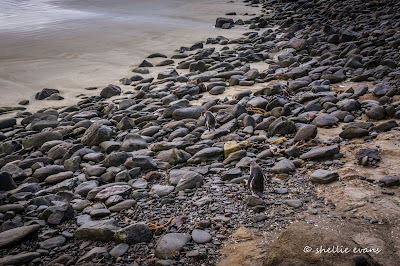 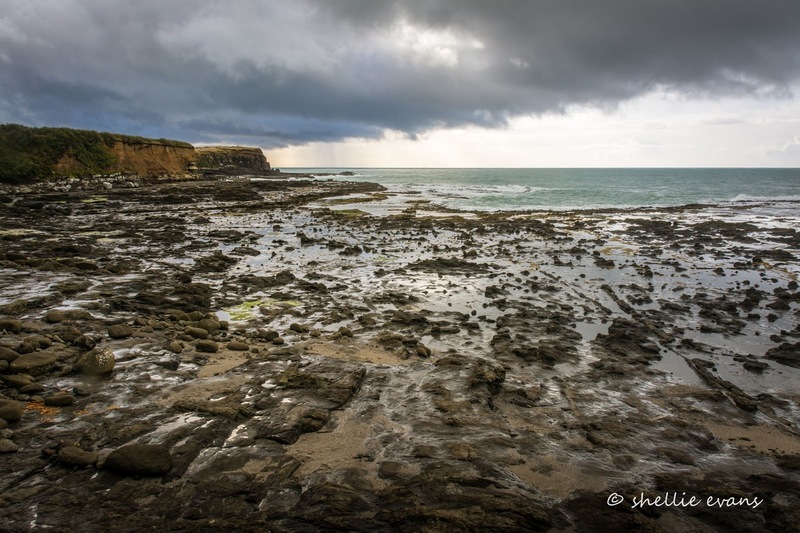 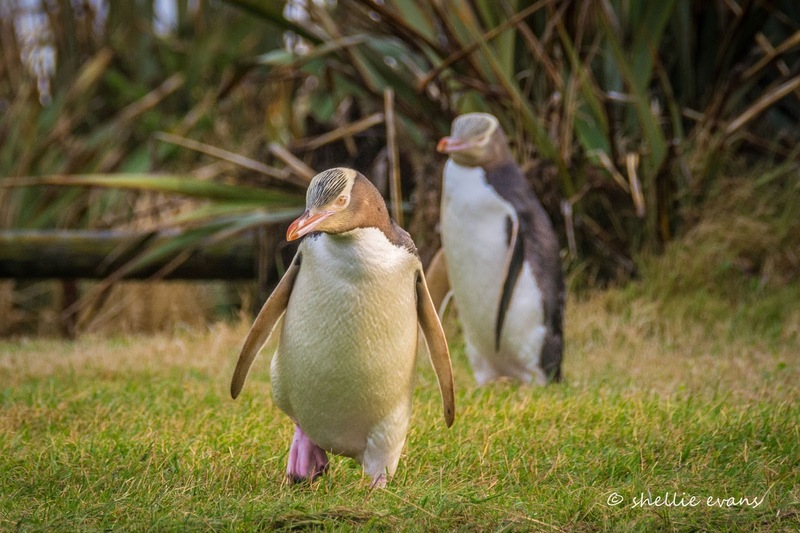 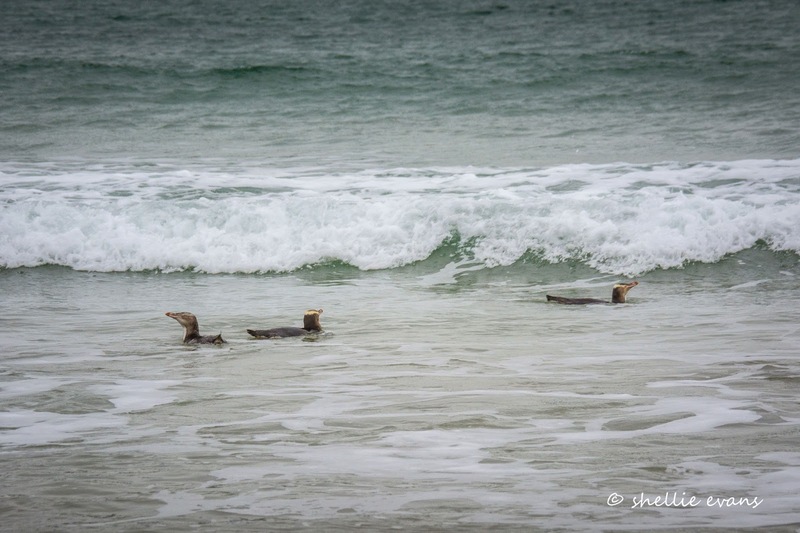 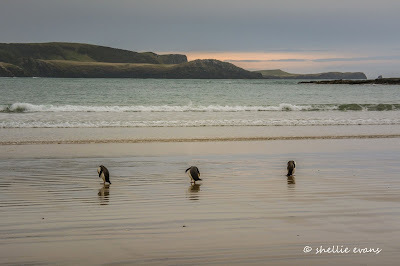 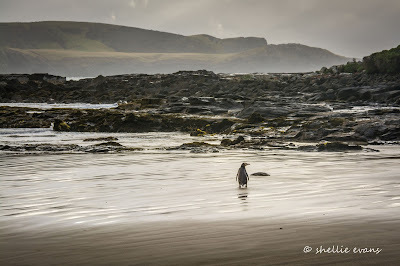 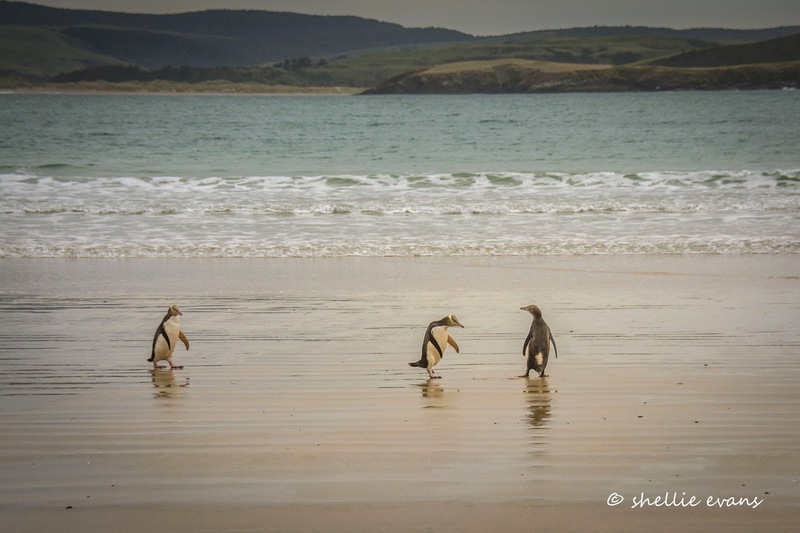 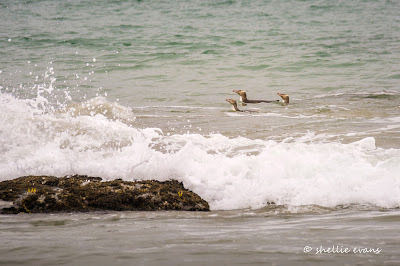 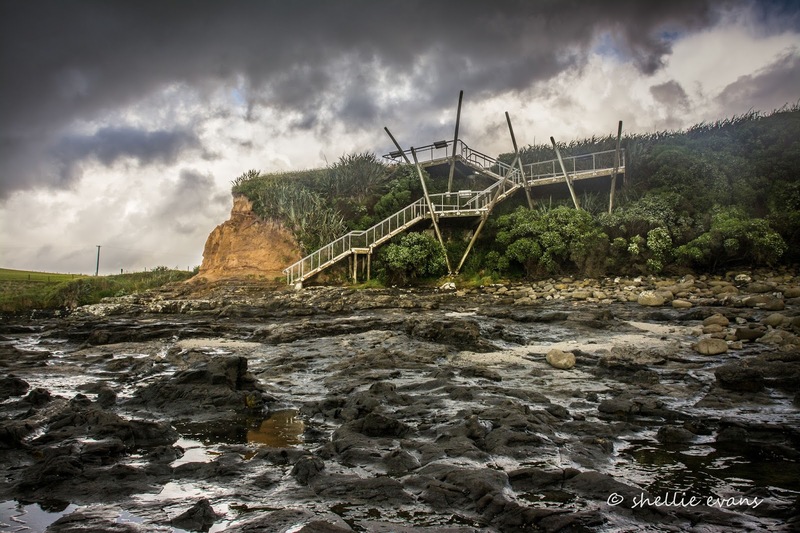 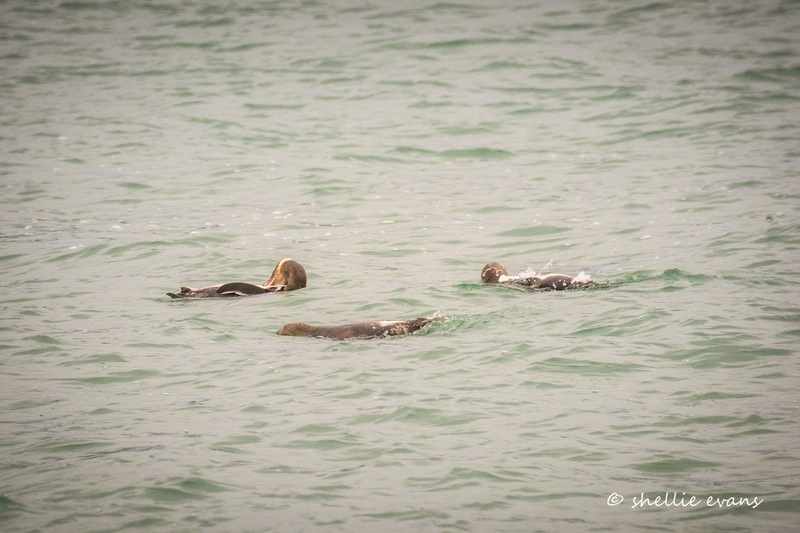 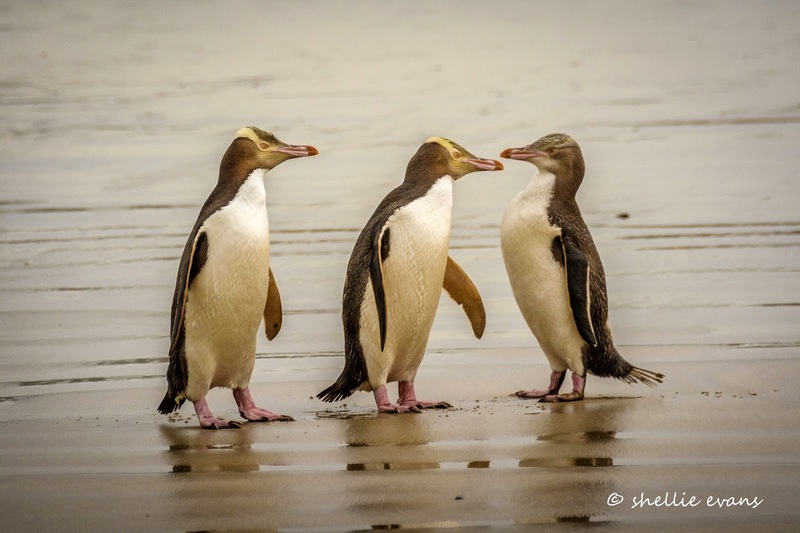 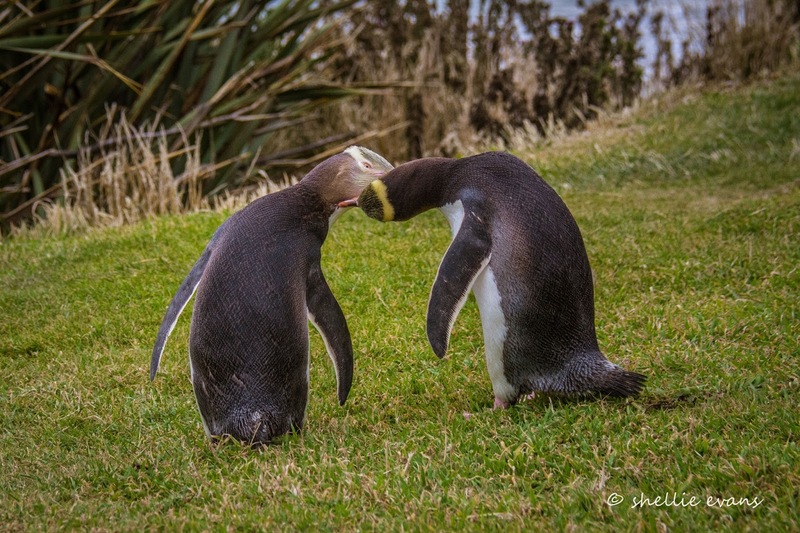 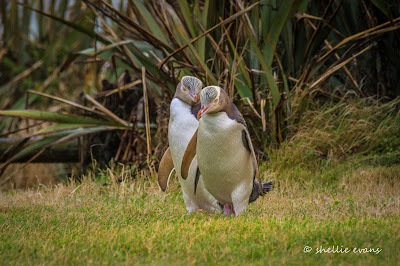 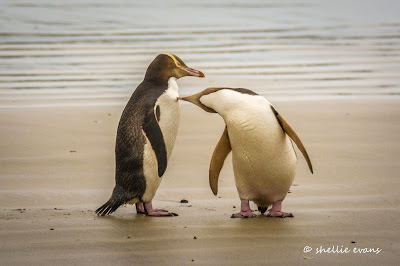 As I drove through the Curio Bay campground towards the lookout, I couldn't believe my eyes, dead ahead of me, right on the edge of the Porpoise Bay lookout carpark were two Yellow-eyed Penguins, one waddling straight towards me. Are you sure that's you? 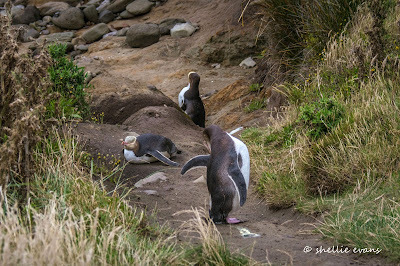 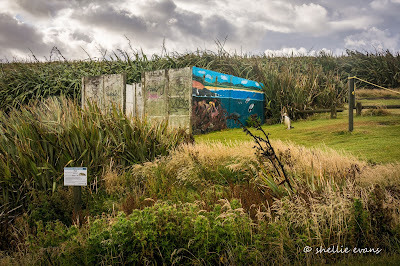 In the photo above you can see the head of the first penguin making his way through the grass, half way up from the sign and just below the flax, they have their own track down to the human's track to the beach. 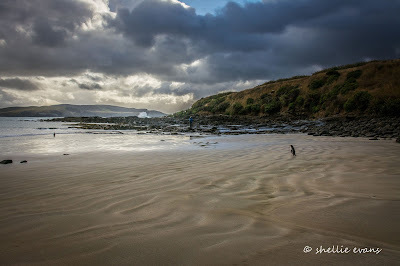 There was a poor attempt at roping off the area, with no signs saying why, so most people stepped over it during the day (you'll see why that's a problem in Part 2). After a fair bit of 'stop, preen, go, stop, preen, go', the pair made it down to the rocks below the track. 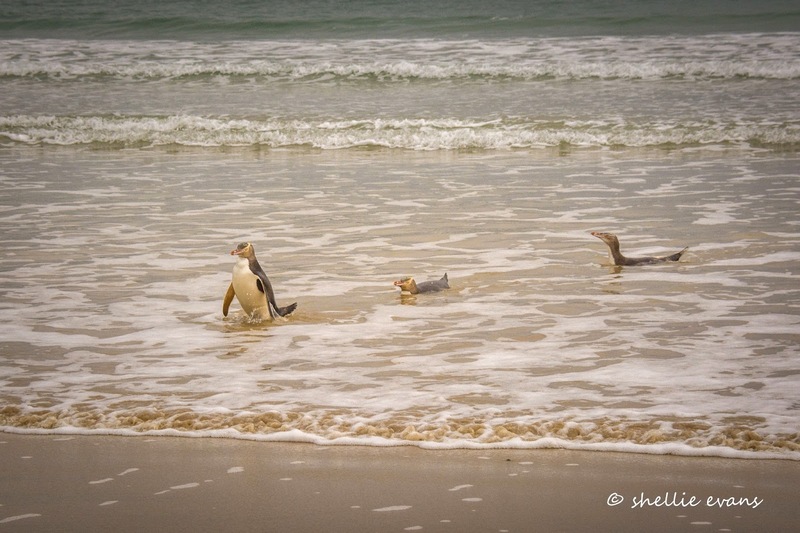 Wait, is this one slippery? 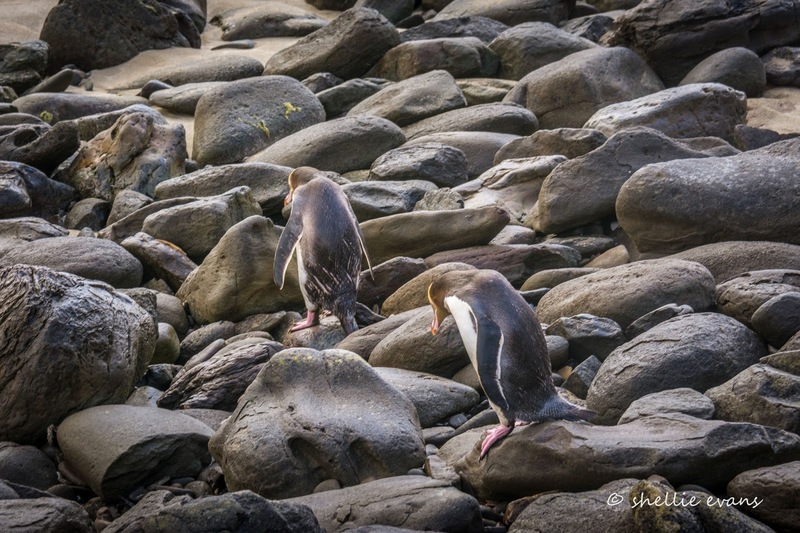 I'm not waiting for you any longer, slippery rocks or not! The Dance of the Hoiho- greeting each other at every opportunity, preening each other & reaffirming their partnership every step of the way. ...and preening, preening, constantly preening. The moult hasn't begun for these two yet, they're just getting ready. For the next few weeks they'll stay close to their home base building up reserves for when they aren't able to go to sea as they wait for their new feathers to become waterproof. 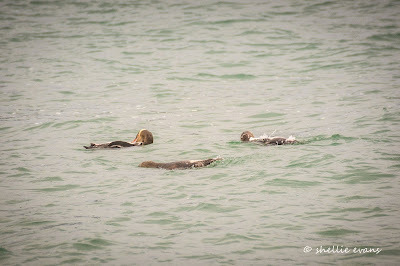 They eventually swam off and it was time for me to head off too. That's Waikawa and Niagara under the rain cloud at the back of the bay, I can just imagine David laying in bed listening to the rain on the roof and thinking 'she's mad, thank God I didn't go'. 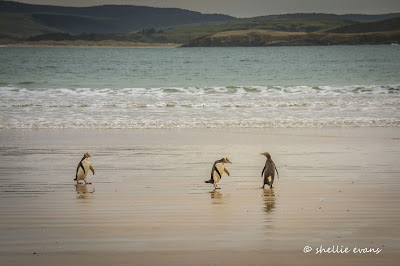 I wouldn't have missed it for the world- just me and a couple of penguins.